FBSnapshotTestCase installation failed with CocoaPods 1.0.0.rc.2 while in preparation for an upcoming presentation to Philadelphia CocoaHeads. I gave Carthage a try, and it worked! I wanted to write it up and share it with you. Now I know that switching to Carthage may not work for everyone just to use a test framework, but maybe there’s a hybrid solution that you could come up with? FBSnapshotTestCase is a testing framework that was originally written at Facebook by Jonathan Dann with significant contributions from Todd Krabach. 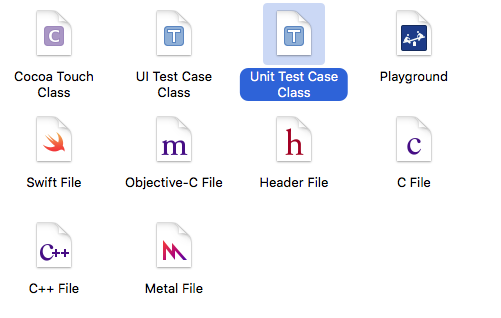 As a testing framework, it allows you to test the user interface of your iOS app by diff’ing screenshots. Yep, you heard me write, you literally take a source screenshot, mark it as “correct” and then all future runs of the test suite use this as the basis for determining if the test passes or not. As my preferred channel, and as the README suggested, I wanted to install FBSnapshotTestCase with CocoaPods, but this issue prevented me from doing so in a Swift project. Instead, I tried using Carthage and was successful. Carthage is an alternate dependency management framework, one that is more lightweight than CocoaPods (and doesn’t require Ruby! YEY). If you don’t have Carthage installed, download the latest .pkg file from here. I used 0.16.2 for this tutorial. 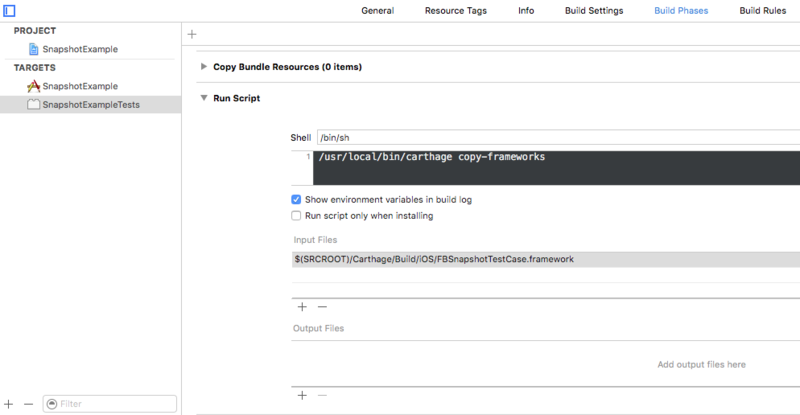 FBSnapshotTestCase Installation was really easy with Carthage. The Cartfile contains your dependencies for the project. While you can specify versions of your dependencies, I was content just picking the latest release, and thus didn’t specify a version. *** Checking out ios-snapshot-test-case at "2.1.0"
A new Carthage/ directory will be created with your dependencies. Carthage is different from CocoaPods, in that, you now need to manually configure the libraries within your Xcode project. Open a Finder window for the root folder of your project, and then navigate down the hierarchy to Carthage/Build/iOS. You should see the framework for FBSnapshotTestCase. At this point, you can try running your new FBSnapshotTestCase (Command-U). Everything should compile, but the test will fail. I’ll be honest, I’m not really sure why this final step is necessary, but without it, the tests would not pass. Carthage’s README indicates it’s necessary for an “App Store submission bug” but I’m not even archiving here, just running tests. Now, try to run your FBSnapshotTestCase again with Command-U. It should compile and pass your test! See, isn’t FBSnapshotTestCase installation easy? Now you’re free to go ahead and use FBSnapshotTestCase to your heart’s content. I plan to write another post that will help you through creating your first FBSnapshotTestCase. If you’re a long time CocoaPods user, I know this isn’t optimal, but hey, look at it this way, at least you have an opportunity to try out Carthage if you’ve never looked at it before. I got a log of inspiration and ideas for installing FBSnapshotTestCase with Carthage from this article on <raywenderlich.com>. Just wanted to let you know the reason for the last step. For a framework to be used at runtime, it has to be both linked _and_ copied into the bundle. If it’s only linked and not copied, then the symbols aren’t found and the app crashes. For a framework only used for unit tests, you could get away with linking and copying as normal. 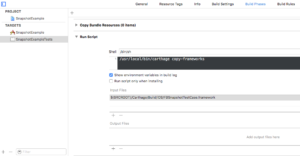 Ie, add it to the link phase and then add a “copy files” build phase to your unit test target with the destination set to “frameworks” and containing your framework.